Hi everyone, this is Mark. 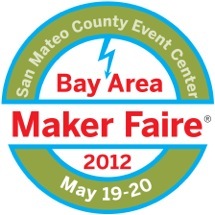 I would like to invite you to visit our booth at Maker Faire this weekend, in San Mateo, California. If you can’t make it, be sure to follow us on twitter to see updates and pictures from the event! I would call it something half way between a trade show and a party, filled with crazy inventions, hobbyists, small companies and big ideas. Joe and I attended last year as guests, but this year we are bringing a booth! Also, if you are in town, but can’t make Maker Faire, you can still see our booth! We are having an open house at our office on May 24th. We will have our booth setup in our office the same way we will have it set up at Maker Faire. This will be our second open house. We had our first one in February, which was a lot of fun!